“The moment will arrive when you are comfortable with who you are, and what you are– bald or old or fat or poor, successful or struggling- when you don’t feel the need to apologize for anything or to deny anything. To be comfortable in your own skin is the beginning of strength.” - Charles B. Handy. From busy mothers to strong professionals, from sports enthusiasts to grandmothers and from team players to sisters going shopping, everyone wants style and functionality. The Ladies Silk Touch polo brings elegance, style and comfort to your day no matter what lies ahead. Whether you are closing a business deal, bringing the kids to a birthday party, playing on the local hockey team or simply going for a bite to eat with friends, the Ladies Silk Polo Touch will have you looking your best, feeling comfortable and ready for anything the day can throw at you. This polo is made out of 100% snag-proof polyester and weighs in at 5 ounces. This garment is rental friendly for businesses that would like these on a short-term basis. Featuring a double needle stich throughout gives this polo a professional, sleek appearance. With a tag free label and a flat knit collar, the polo has a classic look, complimented well by the snag-proof material. Attached to the collar is a 3-button placket, which gives the polo a lengthened appearance with the buttons, fading into the overall color of the polo. Other features of the Port Authority Ladies Silk Touch Polo include set-in, open hem sleeves and side vents. These features make this garment comfortable and breezy no matter what occasion you are wearing it for. Ladies sizes come in a variety of choice, from XS-4XL, accommodating any body types and sizes. 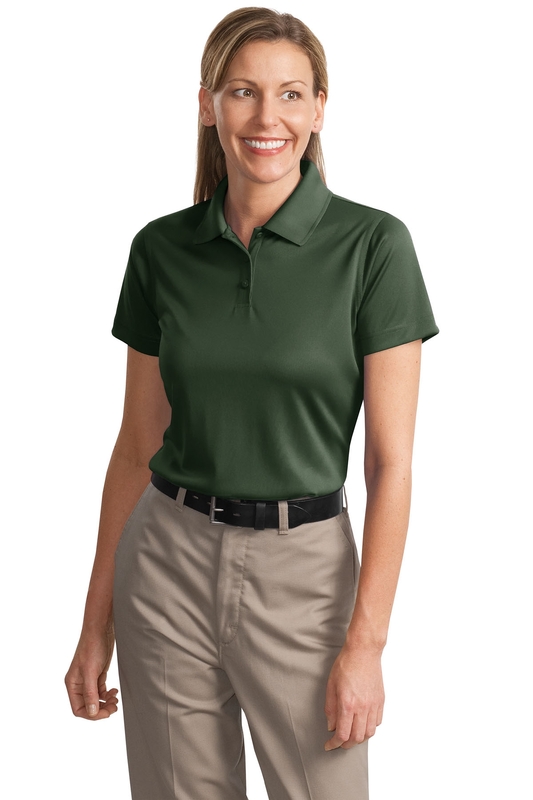 Colors of the Ladies Silk Touch Polo come in many popular colors, including: Black, Dark Green, Dark Navy, Maroon, Red, Royal, Tan and White. Woven garments can often get caught unexpectedly on sharp objects, which can cause unsightly holes or loose threads in your clothing. With the snag proof polyester, you don’t need to worry so much about catching your polo and causing it damage. Also, you have the added advantage of looking and feeling great with the light, breathable material. Don’t forget you can have this polo shirt customized with your logo or emblem to add an extra element of personalization and professionalism.